(Newser) – Nicole McDonald had "one of the most profound moments of [her] life" on Friday, when she finally got to hold her son Jadon, who was born conjoined to his twin brother at the head. 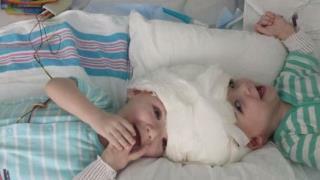 The twins were successfully separated last week during a dangerous, 27-hour surgery in NYC. After one week spent recovering from the surgery, CNN reports McDonald was finally able to hold Jadon for two hours. His brother, Anias, has had more difficulties recovering from the surgery and isn't yet ready to be held. "For over 13 months, I've dreamed of this moment," McDonald wrote on Facebook. "I looked down at Jadon's angelic face and saw him in a way I'd never seen him before." They look quite happy in the photo. I pray all goes well for their recovery. How beautiful, Both are angels on this earth and I hope they are running and riding bikes soon. And yes Jansav.... wonderful that they are sending donations to other kids in need.